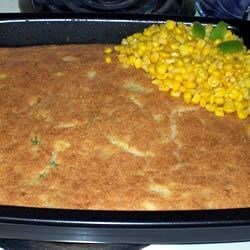 "This cornbread is considered a favorite in our family. It was given to me by my mother-in-law. It is a very thick and hearty cornbread and goes well with most anything. You can also add tomatoes and ground beef." Combine the cornmeal, milk, oil, eggs, chopped green bell pepper, chopped onion, garlic powder, salt, baking soda, sugar, drained corn kernels, pimentos and jalapeno peppers. Mix until combined, and pour into a well greased 10 to 14 inch cast iron skillet. Good flavor, but the texture was too much like a corn pudding and not the corn "bread" I was looking for.